Today i will discuss how to Configure SIP VoIP Service in ZTE OLT. The corresponding VoIP resource data is configured on the SIP server. 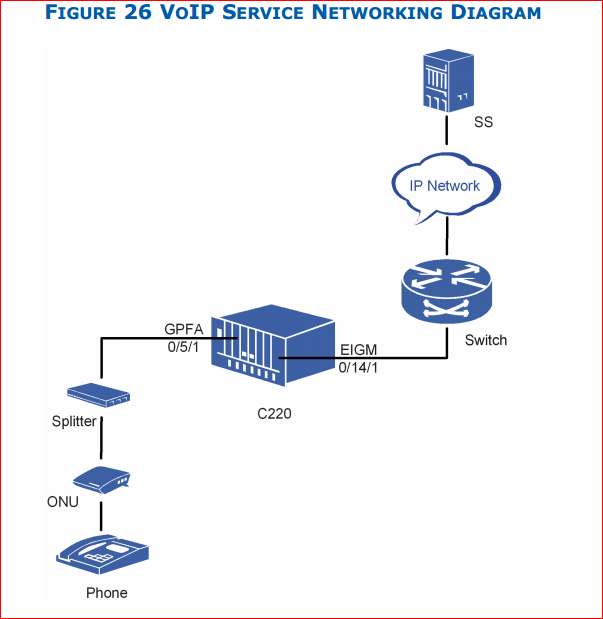 Bellow figure shows the SIP VoIP service networking diagram. 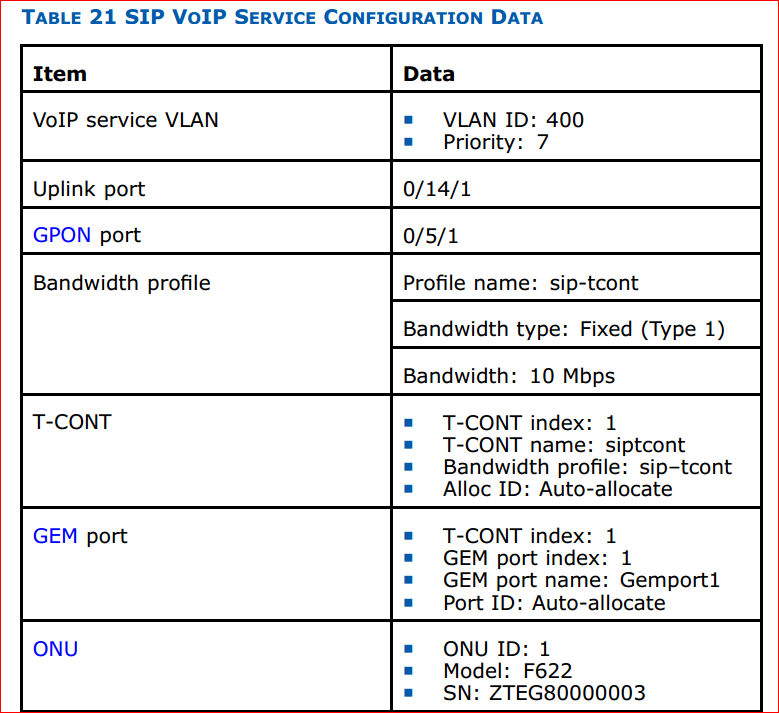 Below Table describes the SIP VoIP service configuration data. Below figure describes the VoIP service configuration flowchart. i. Query unconfigured ONU under GPON-OLT port. i. Enter the GPON configuration mode. T-CONT (Transmission Container) is the minimum unit of upstream bandwidth scheduling which is identified by Alloc ID. GEM port is the minimum unit of downstream traffic which is identified by port ID. 4. Configure VLAN service port. ii. Configure port mode to hybrid. iii. Add port to service VLAN in tag mode. 5. Configure VLAN uplink port. i. Enter the OLT uplink port configuration mode. ii. Configure uplink port mode to hybrid. iii. Add uplink port to service VLAN in tag mode. 6. 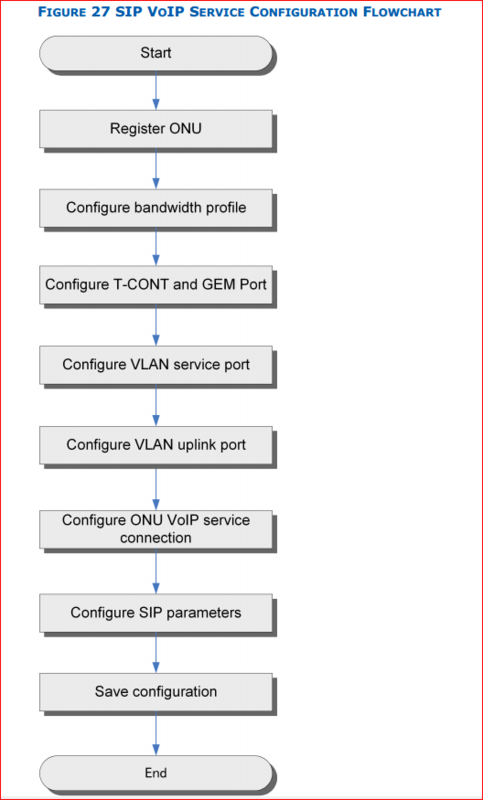 Configure ONU VoIP service flow. i. Enter the ONU remote management mode. ii. 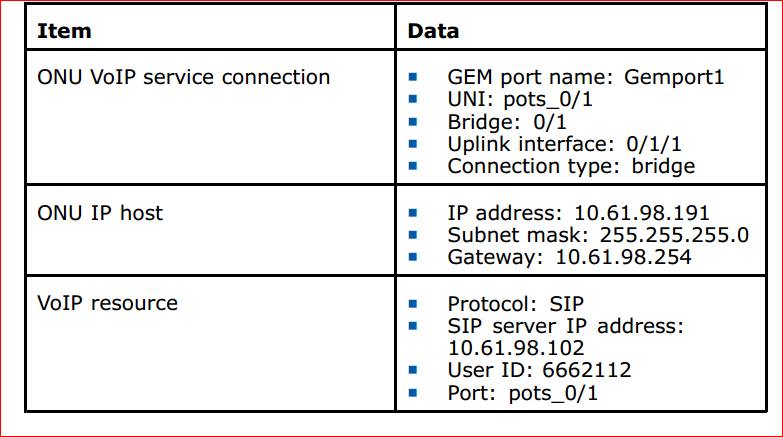 Configure the map between GEM port and uplink interface. iii. Bind the IP host to bridge interface. iv. Configure UNI VLAN and priority. v. Configure VLAN filter mode on IP host. vi. Configure VLAN filter entry on IP host. vii.Configure VLAN filter mode on uplink interface. viii.Configure VLAN filter entry on uplink interface. 7. Configure ONU SIP parameters. i. Configure host IP address and gateway. ii. Configure SIP server IP address. Note: The default port for the SIP protocol is 5060.
iii. Configure port, username and password of the SIP user. Result: The VoIP service is configured successfully.